The answer is YES! 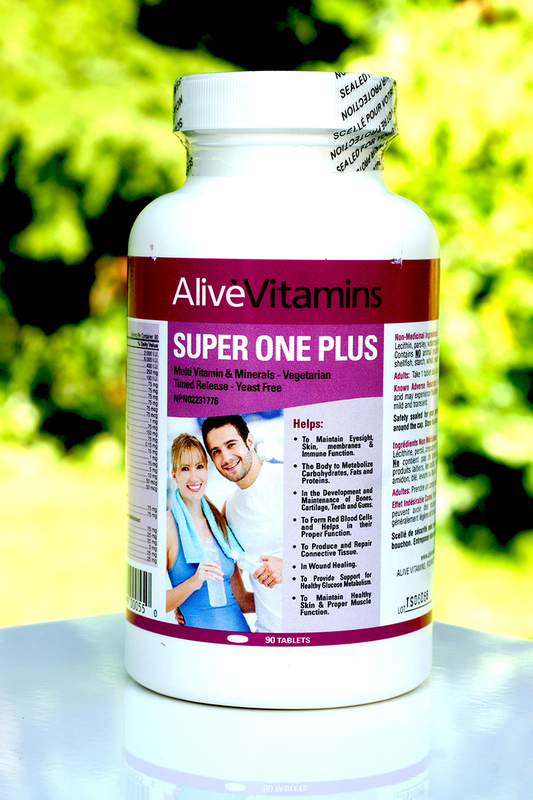 If you do not have any health conditions or have anything specific that you are trying to heal, then the Alive Vitamins Super One Plus is a great place to start. This All in One Multivitamin is a high potency formula offering you a fabulous complete therapeutic dose of vitamins and minerals that will help keep you healthy as well as prevent illnesses down the line. This Multi-Vitamin is not always for everyone, however. It is a large tablet. The next question is always “Why? ?” The reason is, this all in one multi is truly just that and it is not just a sprinkling of vitamins and minerals. This is a true hi-potency therapeutic dose that really helps protect a healthy foundation. If you know you are not a big fan of large pills, then you have to either take a liquid, or a multivitamin that requires you to split up the dose into 2 or 3 pills a day. At Alive Health Centre, Morning Sun and Supplements Plus we feel strongly about helping people find a vitamin regime that works for them. The only way to see results and improvements in your health is to be able to comply with and continue to take your vitamins consistently. 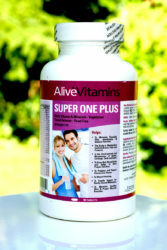 The Alive Vitamins Super One Multivitamin was one of the first formulas to join the family of Alive Vitamins. It is a tried and true formula that is a favourite among: Exhausted University students, people that are busy and on the go, people that need to make sure they are getting everything in the winter as there is not enough variety of fruits and veggies. These are all perfect candidates for this all in one multivitamin. • To maintain eyesight, skin membranes and immune function. • The body to metabolize carbohydrates, fats and proteins. • In the development and maintenance of bones, cartilage, teeth and gums. • To form red blood cells and helps in their proper function. • To produce and repair connective tissue. • To provide support for healthy glucose metabolism. • To maintain healthy skin and proper muscle function. Just one a day and you are on your way to a healthier you! Time Released! High in B-Vitamins helping fight against stress and fatigue. While it is a larger tablet, it is packed full of B Vitamins! 100% Vegetarian. Yeast and gluten free! Alive High Potency Pygeum & Saw Palmetto (Plus Nettle) Helping YOU Get Back To The Man You Were! Today is Customer Appreciation Day! Tues October 3rd 2017! what’s the price of super one plus? It is on sale now until the end of Jan 2018. It is $25.99 for 90 tabs and $43.99 for 180 tabs.